Vintage Coffee Labels- Caffeine addicts unite! Four photographs of spilled coffee beans will warm up your letters, and your day. Perfect way to pay for your morning cup. Our self-adhesive Vintage Roses Address Labels are conveniently bound in books, just like your checkbook, so you can have them on hand whenever you need them. 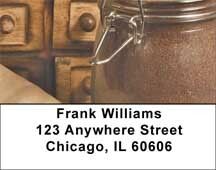 Actual label size is 2 5/8" x 5/8", with up to 4 lines for your personal information. 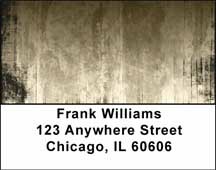 Vintage Abstract Labels - These aged, vintage Address Labels are dark and sophisticated! Elegantly designed and professional, these artistically rendered, unique Labels are distinctive and pronounced! Vintage Abstract Checks - These aged, vintage personal checks are dark and sophisticated! Elegantly designed and professional, these artistically rendered, unique checks are distinctive and pronounced! Add a smile to every piece of mail when you use Vintage Mickey Mouse return address labels. Available in sets of 210 sheeted, self-sticking labels; size 2-1/2" x 7/8". Add elegance to your checkbook with Vintage top stub checks and coordinating accessories. Share Minnie's sweet personality with everyone you send mail to with Vintage Minnie Mouse return address labels! Available in sets of 210 sheeted, self-sticking labels; size 2-1/2" x 7/8". Bring your personal touch to social and professional connections with Vintage Contact Cards. Our high-quality Contact Cards have a premium glossy finish with space for up to 6 lines of personal information. Available in sets of 150. Hey pal! Add color and fun to your mail with Vintage Mickey Mouse return address labels. Available in sets of 210 sheeted, self-sticking labels; size 2-1/2" x 7/8". Vintage Fish Print Personal Checks - In golds and teals, this vintage-inspired fish print check series is ready for you to reel in! Fill your wallet with this trophy catch!